Looks like our friends at Gortemoller Engineering are all smiles! 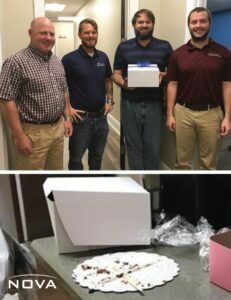 Ann Scruggs, Panama City Beach office, dropped off a homemade chocolate cake to say ‘thank you’ for their past work and to congratulate them on the new office. In record time – – the cake was gone!